The long-awaited Galena Trail directional signs are beginning to be installed along the Trail and Coach Road alignments between Peoria and Galena, Illinois. Marshall County highway engineer, George Meister, and his road crews take the honors for being the first to install their signs. The sign pictured above is located at the intersection of Western Ave. and Yankee Lane. IDOT officials have been working with county and township road commissioners and engineers to coordinate the installation of the signs. The process is much more complicated than any of us had anticipated, and is not expected to be complete until the end of September, 2008. Both the 1825 Galena Trail and the 1833 Coach Road alignments will be marked with directional signs. In some locations, the two alignments follow the same route, but in Marshall, Bureau, and Jo Daviess counties, they are almost completely separate. The routes follow state, county, and township roads. IDOT made all of the signs. It will install its signs on the state highways, and will provide signs to county and township officials for local installation. 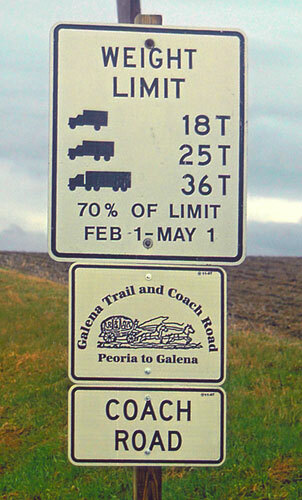 The Galena Trail and Coach Road alignments take the traveler over country roads rarely traveled by tourists. Most of the roads are paved or seal coated, but some are gravel. The gravel roads are well graded and maintained and are open all year. As with all secondary roads, the speed is slower along the Galena Trail and Coach Roads, and allowances must be made for weather and driving conditions.